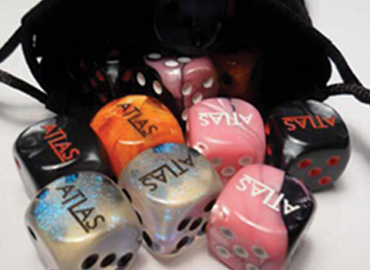 Novelty Dice can feature your logo on any or all sides of the dice. Black, Blue, Green, Red, and White. SET-UP $120.00 for ALL 1" dice. These Large, 1" Transparent Custom Dice are available with your designs on one to six sides of the Custom Dice. The Personalized Dice are made of a durable acrylic plastic, just like Dice used at Crap Tables at casinos. Our Oversized 1" Transparent Personalized Dice are available in your choice of Blue, Clear, Green, or Red.